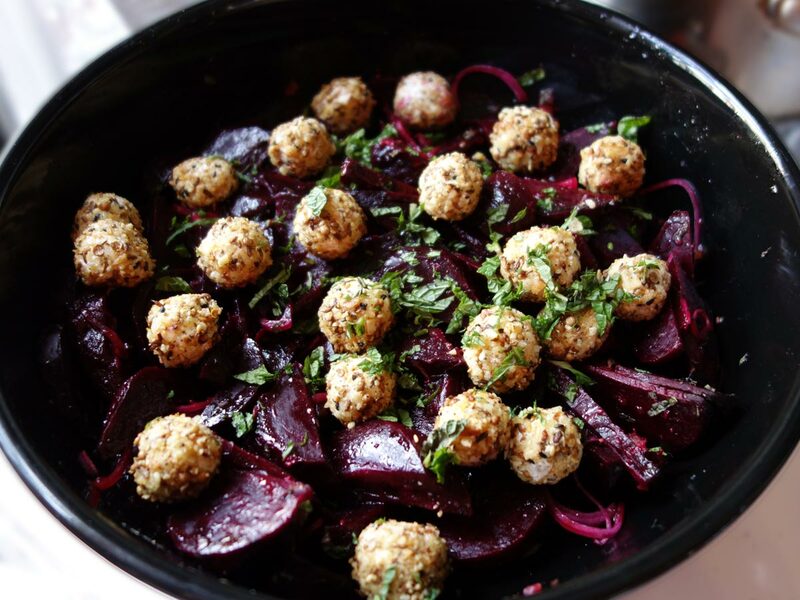 If I’d shown up with a roasted beet salad with a preserved lemon dressing topped with dukkah crusted labne balls I would have had to eat it alone. Sometimes I feel like screaming, “I always loved you! Where were you all of you during the seventies and eighties and nineties?!! !— Fair weather beet lovers. Hmph. One of the reasons that I fell in love with Australia is that the Aussies revere a beet, so much so that they put them on their hamburgers. Yes, the canned ones, along with onions, lettuce, tomato, pineapple, egg and bacon. It’s called a burger with the lot = fierceness! They are so good that you don’t question the meat, which they mysteriously call “mince”, which may or may not actually be beef or even meat, when you eat one. I could murder a burger with a lot right now. BRING IT!!! The upside of what will henceforth be known as The Beet Renaissance of the 21st-century is they’re everywhere. The downside is I have to share. I made this cool looking and delicious salad with them. I know dukkah crusted labne balls sounds nasty, but they’re good. I hope you enjoy it. You could eat any of the three delicious components of this salad on their own, but I combined to make mouth music as part of a brunch I made for friends who tend to be vegetarian-ish. To make labne, line a strainer with doubled over cheesecloth and place over a medium sized bowl. Fill with yogurt. Gather the sides of the cheesecloth and bind it with a rubber band. Place in the refrigerator to drain for 2-3 days. Roll the drained labne into 1” balls and roll them in the dukkah. Set aside. Mix beets, red onions and half the mint with Preserved Lemon Dressing, sea salt and freshly ground black pepper to taste and place in a wide bowl or pile on a platter. Top with labne and sprinkle with remaining mint. This recipe take several days to make if you’re making the labne from scratch. You can buy labne at a Middle Eastern grocery store. My favorite one is Sahadi’s which is in Brooklyn, by me.